This chapter describes how to tune the Program Global Area (PGA). If you are using automatic memory management to manage the database memory on your system, then you do not need to manually tune the PGA as described in this chapter. The Program Global Area (PGA) is a private memory region that contains the data and control information for a server process. Only a server process can access the PGA. Oracle Database reads and writes information in the PGA on behalf of the server process. An example of such information is the run-time area of a cursor. Each time a cursor is executed, a new run-time area is created for that cursor in the PGA memory region of the server process executing that cursor. Part of the run-time area can be located in the Shared Global Area (SGA) when using shared servers. A sort operator uses a work area (the sort area) to perform the in-memory sorting of a set of rows. Similarly, a hash-join operator uses a work area (the hash area) to build a hash table from its left input. Optimal size is when the size of a work area is large enough that it can accommodate the input data and auxiliary memory structures allocated by its associated SQL operator. This is the ideal size for the work area. One-pass size is when the size of the work area is below optimal size and an extra pass is performed over part of the input data. With one-pass size, the response time is increased. Multi-pass size is when the size of the work area is below the one-pass threshold and multiple passes over the input data are needed. With multi-pass size, the response time is dramatically increased because the size of the work area is too small compared to the input data size. For example, a serial sort operation that must sort 10 GB of data requires a little more than 10 GB to run as optimal size and at least 40 MB to run as one-pass size. If the work area is less than 40 MB, then the sort operation must perform several passes over the input data. Multi-pass executions can severely degrade performance. A high number of multi-pass work areas has an exponentially adverse effect on the response time of its associated SQL operator. Running one-pass executions does not require a large amount of memory. Only 22 MB is required to sort 1 GB of data in one-pass size. Even for DSS systems running large sorts and hash-joins, the memory requirement for one-pass executions is relatively small. A system configured with a reasonable amount of PGA memory should not need to perform multiple passes over the input data. Automatic PGA memory management simplifies and improves the way PGA memory is allocated. By default, PGA memory management is enabled. In this mode, Oracle Database automatically sizes the PGA by dynamically adjusting the portion of the PGA memory dedicated to work areas, based on 20% of the SGA memory size. The minimum value is 10MB. For backward compatibility, automatic PGA memory management can be disabled by setting the value of the PGA_AGGREGATE_TARGET initialization parameter to 0. When automatic PGA memory management is disabled, the maximum size of a work area can be sized with the associated _AREA_SIZE parameter, such as the SORT_AREA_SIZE initialization parameter. When running Oracle Database in automatic PGA memory management mode, sizing of work areas for all sessions is automatic, and the *_AREA_SIZE parameters are ignored by all sessions running in this mode. Oracle Database automatically derives the total amount of PGA memory available to active work areas from the PGA_AGGREGATE_TARGET initialization parameter. The amount of PGA memory is set to the value of PGA_AGGREGATE_TARGET minus the amount of PGA memory allocated to other components of the system (such as PGA memory allocated by sessions). Oracle Database then assigns the resulting PGA memory to individual active work areas based on their specific memory requirements. Oracle Database attempts to adhere to the PGA_AGGREGATE_TARGET value set by the DBA by dynamically controlling the amount of PGA memory allotted to work areas. To accomplish this, Oracle Database first tries to maximize the number of optimal work areas for all memory-intensive SQL operations. The rest of the work areas are executed in one-pass mode, unless the PGA memory limit set by the DBA (using the PGA_AGGREGATE_TARGET parameter) is so low that multi-pass execution is required to reduce memory consumption to honor the PGA target limit. When configuring a new database instance, it can be difficult to determine the appropriate setting for PGA_AGGREGATE_TARGET. Make an initial estimate for the value of the PGA_AGGREGATE_TARGET parameter, as described in "Setting the Initial Value for PGA_AGGREGATE_TARGET". Run a representative workload on the database instance and monitor its performance, as described in "Monitoring Automatic PGA Memory Management". Tune the value of the PGA_AGGREGATE_TARGET parameter using Oracle PGA advice statistics, as described in "Tuning PGA_AGGREGATE_TARGET". Set the initial value of the PGA_AGGREGATE_TARGET initialization parameter based on the amount of available memory for the Oracle database instance. This value can then be tuned and dynamically modified at the instance level. By default, Oracle Database uses 20% of the SGA size for this value. However, this setting may be too low for a large DSS system. Determine how much of the total physical memory to reserve for the operating system and other non-Oracle applications running on the same system. For example, you might decide to reserve 20% of the total physical memory for the operating system and other non-Oracle applications, dedicating 80% of the memory on the system to the Oracle database instance. For OLTP systems, the PGA memory typically makes up a small fraction of the available memory, leaving most of the remaining memory for the SGA. PGA_AGGREGATE_TARGET = (total_mem * 0.8) * 0.2 where total_mem is the total amount of physical memory available on the system. For DSS systems running large, memory-intensive queries, PGA memory can typically use up to 70% of the available memory. PGA_AGGREGATE_TARGET = (total_mem * 0.8) * 0.5 where total_mem is the total amount of physical memory available on the system. For example, if an Oracle database instance is configured to run on a system with 4 GB of physical memory, and if 80% (or 3.2 GB) of the memory is dedicated to the Oracle database instance, then initially set PGA_AGGREGATE_TARGET to 640 MB for an OLTP system, or 1,600 MB for a DSS system. Before starting the tuning process, run a representative workload on the database instance and monitor its performance. PGA statistics collected by Oracle Database enable you to determine if the maximum PGA size is under-configured or over-configured. Monitoring these statistics enables you to assess the performance of automatic PGA memory management and tune the value of the PGA_AGGREGATE_TARGET parameter accordingly. The V$PGASTAT view provides instance-level statistics about PGA memory usage and the automatic PGA memory manager. The following example shows a query of this view. Table 16-1 describes the main statistics shown in the V$PGASTAT view. This statistic shows the current value of the PGA_AGGREGATE_TARGET parameter. The default value is 20% of the SGA size. Setting this parameter to 0 disables automatic PGA memory management. This statistic shows the amount of PGA memory Oracle Database can use for work areas running in automatic mode. This amount is dynamically derived from the value of the PGA_AGGREGATE_TARGET parameter and the current work area workload. Hence, it is continuously adjusted by Oracle Database. If this value is small compared to the PGA_AGGREGATE_TARGET value, then most of PGA memory is used by other system components (such as PL/SQL or Java) and little is left for work areas. Ensure that enough PGA memory remains for work areas running in automatic mode. This statistic shows the maximum size of a work area executed in automatic mode. This value is continuously adjusted by Oracle Database to reflect the current state of the work area workload. The global memory bound generally decreases when the number of active work areas increases in the system. As a rule of thumb, the value of the global bound should not decrease to less than 1 MB. If it does, increase the value of the PGA_AGGREGATE_TARGET parameter. This statistic shows the current amount of PGA memory allocated by the database instance. Oracle Database tries to keep this number less than the PGA_AGGREGATE_TARGET value. However, if the work area workload is increasing rapidly or the PGA_AGGREGATE_TARGET parameter is set to a value that is too low, it is possible for the PGA allocated to exceed this value by a small percentage and for a short time. This statistic indicates how much allocated PGA memory can be freed. This statistic is cumulative from instance startup. Over-allocating PGA memory can happen if the PGA_AGGREGATE_TARGET value is too small to accommodate the PGA other component and the minimum memory required to execute the work area workload. In this case, Oracle Database cannot honor the PGA_AGGREGATE_TARGET value, and extra PGA memory must be allocated. If over-allocation occurs, increase the value of the PGA_AGGREGATE_TARGET parameter using the information provided by the V$PGA_TARGET_ADVICE view, as described in "Using the V$PGA_TARGET_ADVICE View". This statistic indicates the number of bytes processed by memory-intensive SQL operators since instance startup. For example, the number of bytes processed is the input size for a sort operation. This number is used to compute the cache hit percentage metric. When a work area cannot run optimally, one or more extra passes is performed over the input data. This statistic represents the number of bytes processed during these extra passes since instance startup. This number is also used to compute the cache hit percentage metric. Ideally, it should be small compared to total bytes processed. 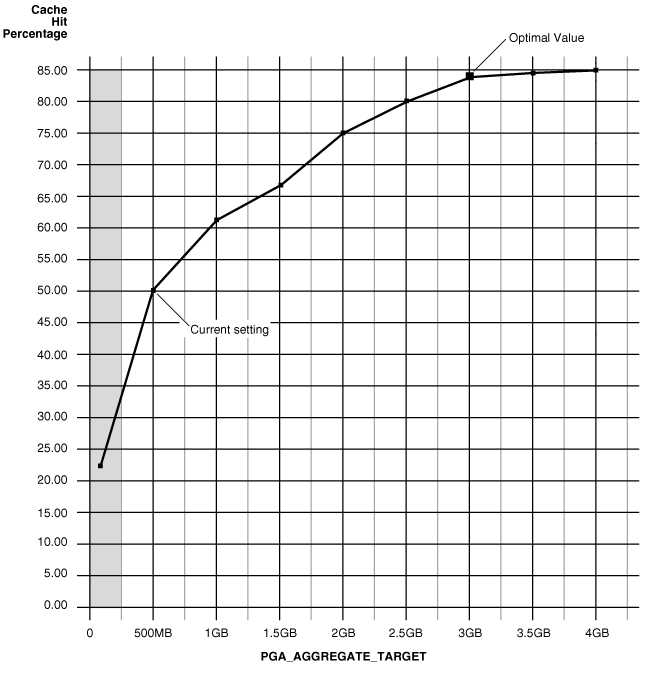 This metric is computed by Oracle Database to reflect the performance of the PGA memory component. It is cumulative from instance startup. A value of 100% means that all work areas executed by the system since instance startup are using an optimal amount of PGA memory. This is ideal but rarely happens except for pure OLTP systems. Typically, some work areas run one-pass or even multi-pass, depending on the overall size of the PGA memory. When a work area cannot run optimally, one or more extra passes are performed over the input data. This reduces the cache hit percentage in proportion to the size of the input data and the number of extra passes performed. For an example of how this metric is calculated, see Example 16-1. Example 16-1 shows how extra passes affect the cache hit percentage metric. Four sort operations have been executed, three were small (1 MB of input data) and one was bigger (100 MB of input data). The total number of bytes processed (BP) by the four operations is 103 MB. If one of the small sorts runs one-pass, an extra pass over 1 MB of input data is performed. This 1 MB value is the number of extra bytes read/written, or EBP. In this example, the cache hit percentage is 99.03%. This value reflects that only one of the small sort operations performed an extra pass, while all other sort operations were able to run in optimal size. Therefore, the cache hit percentage is almost 100%, because the extra pass over 1 MB represents a tiny overhead. However, if the bigger sort operation runs in one-pass size, then the EBP is 100 MB instead of 1 MB, and the cache hit percentage falls to 50.73%, because the extra pass has a much bigger impact. Example 16-2 shows a query of this view. The V$SQL_WORKAREA_HISTOGRAM view shows the number of work areas executed with optimal, one-pass, and multi-pass memory size since instance startup. Statistics in this view are divided into buckets. The buckets are defined by the optimal memory requirements of the work areas. Each bucket is identified by a range of optimal memory requirements, specified by the values in the LOW_OPTIMAL_SIZE and HIGH_OPTIMAL_SIZE columns. Statistics are segmented by work area size, because the performance impact of running a work area in optimal, one-pass or multi-pass size depends mainly on the size of the work area. In this example, statistics about the work area are placed in this bucket because 3 MB lies within that range of optimal sizes. Example 16-3 and Example 16-4 show two methods for querying this view. In this example, the output shows that—in the 1 MB to 2 MB bucket—551 work areas ran in optimal size, while 16 ran in one-pass size and none ran in multi-pass size. It also shows that all work areas under 1 MB were able to run in optimal size. In this example, the output shows that 81.63% of the work areas were able to run in optimal size. The remaining work areas (18.37%) ran in one-pass size and none of them ran in multi-pass size. The V$WORKAREA_ACTIVE view displays the work areas that are active (or executing) in the database instance. Small, active sort operations (under 64 KB) are excluded from this view. Use this view to precisely monitor the size of all active work areas and to determine whether these active work areas spill to a temporary segment. Example 16-5 shows a query of this view. When the work area is deallocated—or when the execution of its associated SQL operator is complete—it is automatically removed from this view. Oracle Database maintains cumulative work area statistics for each loaded cursor whose execution plan uses one or more work areas. Each time a work area is deallocated, the V$SQL_WORKAREA view is updated with execution statistics for that work area. You can join the V$SQL_WORKAREA view with the V$SQL view to relate a work area to a cursor, and with the V$SQL_PLAN view to precisely determine which operator in the plan uses a work area. Example 16-6 shows three queries of this view. To help you tune the value of the PGA_AGGREGATE_TARGET initialization parameter, Oracle Database provides two PGA performance advisory views: V$PGA_TARGET_ADVICE and V$PGA_TARGET_ADVICE_HISTOGRAM. By using these views, you do not need to use an empirical approach to tune the value of the PGA_AGGREGATE_TARGET parameter. Instead, you can use these views to predict how changing the value of the PGA_AGGREGATE_TARGET parameter will affect key PGA statistics. Oracle Database generates the V$PGA_TARGET_ADVICE and V$PGA_TARGET_ADVICE_HISTOGRAM views by recording the workload history, and then simulating this history for different values of the PGA_AGGREGATE_TARGET parameter. The values of the PGA_AGGREGATE_TARGET parameter are derived from fractions and multiples of its current value to assess possible higher and lower values. These values are used for the prediction and range from 10 MB to a maximum of 256 GB. The simulation process happens in the background and continuously updates the workload history to produce the simulation result. You can view the result at any time by querying these views. Set the PGA_AGGREGATE_TARGET parameter to enable automatic PGA memory management. Setting this parameter to 0 disables automatic PGA memory management and is not recommended. For information about setting this parameter, see "Setting the Initial Value for PGA_AGGREGATE_TARGET". Set the STATISTICS_LEVEL parameter to TYPICAL (the default) or ALL. Setting this parameter to BASIC disables generation of the PGA performance advice views and is not recommended. The contents of the PGA advice performance views are reset at instance startup or when the value of the PGA_AGGREGATE_TARGET parameter is changed. Figure 16-1 illustrates how the result of the this query can be plotted. Description of "Figure 16-1 Graphical Representation of V$PGA_TARGET_ADVICE"
The curve shows how PGA cache hit percentage improves as the value of the PGA_AGGREGATE_TARGET parameter increases. The shaded zone in the graph represents the over allocation zone, where the value of the ESTD_OVERALLOCATION_COUNT column is non-zero. This area indicates that the value of the PGA_AGGREGATE_TARGET parameter is too small to meet the minimum PGA memory requirements. If the value of the PGA_AGGREGATE_TARGET parameter is set within the over allocation zone, then the memory manager will over-allocate memory and the actual PGA memory consumed will exceed the limit that was set. It is therefore meaningless to set a value of the PGA_AGGREGATE_TARGET parameter in that zone. In this particular example, the PGA_AGGREGATE_TARGET parameter should be set to at least 375 MB. Beyond the over allocation zone, the value of the PGA cache hit percentage increases rapidly. This is due to an increase in the number of optimal or one-pass work areas and a decrease in the number of multi-pass executions. At some point, around 500 MB in this example, an inflection in the curve corresponds to the point where most (probably all) work areas can run in optimal or at least one-pass size. Beyond this point, the cache hit percentage keeps increasing, though at a lower pace, up to the point where it starts to taper off and only slight improvement is achieved with increase in the value of the PGA_AGGREGATE_TARGET parameter. In Figure 16-1, this happens when PGA_AGGREGATE_TARGET reaches 3 GB. At this point, the cache hit percentage is 83% and only marginal improvement (by 2%) is achieved with one extra gigabyte of PGA memory. In this example, 3 GB is the optimal value for the PGA_AGGREGATE_TARGET parameter. Although the theoretical maximum for the PGA cache hit percentage is 100%, a practical limit exists on the maximum size of a work area that may prevent this theoretical maximum from being reached, even when the value of the PGA_AGGREGATE_TARGET parameter is further increased. This should happen only in large DSS systems where the optimal memory requirement is large and may cause the value of the cache hit percentage to taper off at a lower percentage, such as 90%. Ideally, the value of the PGA_AGGREGATE_TARGET parameter should be set to the optimal value, or at least to the maximum value possible in the region beyond the over allocation zone. As a rule of thumb, the PGA cache hit percentage should be higher than 60%, because at 60% the system is almost processing double the number of bytes it actually needs to process in an ideal situation. In this example, the value of the PGA_AGGREGATE_TARGET parameter should be set to at least 500 MB, and as close to 3 GB as possible. However, the correct setting for the PGA_AGGREGATE_TARGET parameter depends on how much memory can be dedicated to the PGA component. Generally, adding PGA memory requires reducing memory for some SGA components—like the shared pool or buffer cache—because the overall memory dedicated to the database instance is often bound by the amount of physical memory available on the system. Therefore, any decisions to increase PGA memory must be taken in the larger context of the available memory in the system and the performance of the various SGA components (which you can monitor with shared pool advisory and buffer cache advisory statistics). If you cannot reduce memory from the SGA components, consider adding more physical memory to the system. The V$PGA_TARGET_ADVICE_HISTOGRAM view predicts how changing the value of the PGA_AGGREGATE_TARGET initialization parameter will affect the statistics in the V$SQL_WORKAREA_HISTOGRAM view. Use this view to display detailed information about the predicted number of optimal, one-pass, and multi-pass work area executions for the PGA_AGGREGATE_TARGET values used for the prediction. The V$PGA_TARGET_ADVICE_HISTOGRAM view is identical to the V$SQL_WORKAREA_HISTOGRAM view, with two additional columns to represent the PGA_AGGREGATE_TARGET values used for the prediction. Therefore, any query executed against the V$SQL_WORKAREA_HISTOGRAM view can be used on this view, with an additional predicate to select the desired value of the PGA_AGGREGATE_TARGET parameter. Example 16-7 shows a query of this view that displays the predicted content of the V$SQL_WORKAREA_HISTOGRAM view for a value of the PGA_AGGREGATE_TARGET parameter set to twice its current value. In this example, the output shows that increasing the value of the PGA_AGGREGATE_TARGET parameter by a factor of 2 will enable all work areas under 16 MB to execute in optimal size. Statistics in the V$SYSSTAT and V$SESSTAT views show the total number of work areas executed with optimal, one-pass, and multi-pass memory size. These statistics are cumulative since the instance or the session was started. In this example, the output shows that 5,395 work area executions (or 95%) were executed in optimal size, and 284 work area executions (or 5%) were executed in one-pass size. This tutorial provides a guideline for tuning the value of the PGA_AGGREGATE_TARGET parameter using the various views discussed in this chapter. Set the value of the PGA_AGGREGATE_TARGET parameter to avoid memory over-allocation. Use the V$PGA_TARGET_ADVICE view to ensure that the PGA_AGGREGATE_TARGET value is not set within the over-allocation zone, as described in "Using the V$PGA_TARGET_ADVICE View". In Example 16–8, the PGA_AGGREGATE_TARGET value should be set to at least 375 MB. Maximize the PGA cache hit percentage, based on response time requirements and memory constraints. Use the V$PGA_TARGET_ADVICE view to determine the optimal value for the PGA_AGGREGATE_TARGET parameter and set its value to the optimal value, or to the maximum value possible, as described in "Using the V$PGA_TARGET_ADVICE View". If limit X is higher than the optimal value, set the value of the PGA_AGGREGATE_TARGET parameter to the optimal value. In Example 16–8, if you have 10 GB to dedicate to PGA, set the value of the PGA_AGGREGATE_TARGET parameter to 3 GB and dedicate the remaining 7 GB to the SGA. If limit X is less than the optimal value, set the value of the PGA_AGGREGATE_TARGET parameter to X. In Example 16–8, if you have only 2 GB to dedicate to PGA, set the value of the PGA_AGGREGATE_TARGET parameter to 2 GB and accept a cache hit percentage of 75%. Verify that the new value of the PGA_AGGREGATE_TARGET parameter will result in the desired number of optimal and one-pass work area executions and avoid any multi-pass work area executions. Use the V$PGA_TARGET_ADVICE_HISTOGRAM view to predict the number of optimal, one-pass, and multi-pass work area executions, as described in "Using the V$PGA_TARGET_ADVICE_HISTOGRAM View". If more PGA memory is required, then increase PGA memory by either reducing memory from SGA components or adding more physical memory to the system. At any time, ensure the number of optimal, one-pass, and multi-pass work area executions matches predictions and tune the value of the PGA_AGGREGATE_TARGET parameter if necessary. Use the V$SYSSTAT and V$SESSTAT views to verify the total number of work areas executed with optimal, one-pass, and multi-pass memory size since instance or session startup, respectively, as described in "Using the V$SYSSTAT and V$SESSTAT Views". The PGA_AGGREGATE_TARGET setting acts as a target, and not a limit. PGA_AGGREGATE_TARGET only controls allocations of tunable memory. Excessive PGA usage can lead to high rates of swapping. When this occurs, the system may become unresponsive and unstable. In this case, consider using the PGA_AGGREGATE_LIMIT initialization parameter to limit overall PGA usage. Calls for sessions that are consuming the most untunable PGA memory are aborted. If PGA memory usage is still over the PGA_AGGREGATE_LIMIT, then the sessions and processes that are consuming the most untunable PGA memory are terminated. In determining the sessions and processes to abort or terminate, Oracle Database treats parallel queries as a single unit. By default, the PGA_AGGREGATE_LIMIT parameter is set to the greater of 2 GB, 200% of the PGA_AGGREGATE_TARGET value, or 3 MB times the value of the PROCESSES parameter. However, it will not exceed 120% of the physical memory size minus the total SGA size. The default value is printed into the alert log. A warning message is printed in the alert log if the amount of physical memory on the system cannot be determined. The PGA_AGGREGATE_LIMIT initialization parameter can be set dynamically; a database restart is not necessary. You can set the value of PGA_AGGREGATE_LIMIT regardless of whether automatic memory management is being used. Set the PGA_AGGREGATE_LIMIT initialization parameter to a desired value in number of bytes. The value is expresses as a number followed by K (for kilobytes), M (for megabytes), or G (for gigabytes). Setting the value to 0 disables the hard limit on PGA memory.